During the end of September the Cambodia Holiday, Bonn Pchum Ben was celebrated. Bonn Pchum Ben is a Cambodian festival held for commemoration of the spirits of the dead ancestors, relatives and friends. For 15 days people take turns, offering food to the monks of their local pagodas. During the first 14 days, people take turns offering food to the monks of their local pagoda in the hope that their offering will reach the souls of their ancestors by virtue of the monks’ sermons. On the final day of Bonn Pchum Ben at every pagoda around the country, the offerings are dedicated en masse to the souls of the ancestors. If a family fails to carry out this important duty, a soul is cursed and will haunt the family until the end of the year. At Wat Opot we were blessed (or was it cursed?) with the continuous sounds coming from the Wat (temple) next door. There was music, chanting, and a continuous flow of visitors pouring into and out of the Wat. Some families had a private session with the monks and two of our teens (brother and sister) invited whoever wanted to come to the Wat for a special ceremony honoring their deceased mother. (who died of AIDS related illness years ago.) Once we were seated in front of a row of monks the teens made their offering of yummy iced coffee to each person and monk there. It was an unusual offering and a couple of the monks were probably wired the rest of the evening because I helped make the coffee and anyone who knows me knows I like my coffee STRONG! Everyone became quiet as the monks began to chant. The ceremony didn’t last long, but it was a very special time for the siblings and they were happy to have us join them. As with any holiday in any country the days are filled with food and Bonn Pchum Ben was no exception. 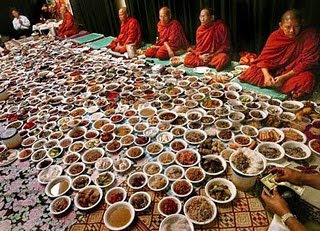 There was a continuous stream of food brought over to us as the monks couldn’t possibly eat everything offered to them. I didn’t partake in consuming most items as I was never sure whether it contained some sneaky little fish or other animal product, but there was one sweet treat, I didn’t resist. Not because it looked so appetizing -on the contrary, it wouldn’t even make the list of my favorite foreign treats- but because it was intriguing. Nom cheil (spelling?) is like a huge chunk of cookie dough…but doesn’t really taste like it; it was sweet, but more gummy. I was talking to two of the boys about it because I kept seeing small children chewing on blocks of dough bigger than their face…and Doar mentioned that Vandy was cooking some. When I replied “Wha?” they said, “Yes, on the roof”. I have learned to believe most things the kids say no matter how bizarre it sounds, so I said, “Please show me”. Vandy promptly climbed up on the boys dorm room and retrieved the dough from the hot tin roof and then climbed down with the hot treat in hand. As with many treats here, they are shared; so I didn’t indulge in Vandy’s hot treat as it had about 50 bite marks in it and loving the kids is one thing, but gnawing on a large chunk of food that many mouths had gnawed on previously…well, let’s say I passed on that particular opportunity. Later that day, I walked past the café and I was offered some of the sweet treat that had been fried! Putting the earlier version out of my mind (figuring the hot oil will kill anything) I tasted it prepared this way. It was much better than its rooftop version! Usually this time of year many of the kids go home to extended family for the long holiday, but this year many choose to stay at Wat Opot or their family didn’t come for them. This is also the one time of the year where many family members (aunts/uncles/siblings without HIV who did not get kicked out of the home/etc.) show up to pay homage to the child of their dead relative. They show up assumedly only because of superstition (they don’t want the ‘ghost’ of the deceased to haunt them), not because they actually want to see the child. This year we had a very low turnout of family visiting. On the outside, the kids go on and you don’t notice a difference, but deep down, there must be hurt. I loved the holiday not only because of the festivities, but because the staff were off for a week and many times it was just a couple of us with the kids day and night and with some of them gone there was a bit more one on one opportunities. A week filled with food and fun…what more could you ask for! !